In the first post I described the initial situation (Impact of ACM Implementation on BAM). And in the second post I described the solutions we have recognised/examined to make Management Information (MI) available to the ACM implementation. During this examination we also looked in detail to the BAM database. The relevant findings of this are described in this post. In this description we begin from BAM. The Data Objects of the ACM case with associated Case Activities can be found in the processanalytics directory of BAM. See figure below. The default Data Object ‘Activity ‘ looks like this. 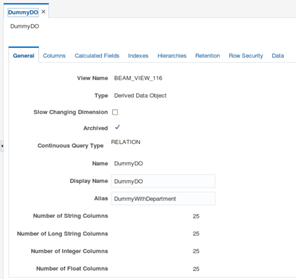 Where it is about here is that there is a reference to the used database view (BEAM_VIEW_25). We also see that the ALIAS field is not filled in. In the following custom Data Object we see that there is an ALIAS filled in. The filled in alias is the ‘Synonym’ of the view on the database. In the list below we see that there is a synonym on the database for beam_view_116 and for beam_view_25 that this is not the case. Read the complete article here.